Stealth GPS-2 has been presented. It is the new GPS stop watch Starlane, by now at the third generation of its own satellite devices, has developed to build in an ultra-compact instrument, all the technology by now improved with thousands of customers all over the world, pleased by Athon GPS, the elder brother. 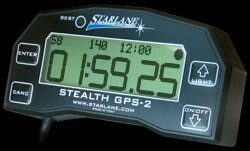 Just as competitors start releasing the first GPS stop watches, after having acquired a four-year experience in accomplishing reliable and successful GPS products, Starlane is offering the market a unique product at a competitive price, considering its features of memory, functional capacity and wireless data download by means of software programmes that can analyse trajectories, thus enabling the driver to improve his/her performance.